or Quest for Fire III: Survivor. Over the last few months, we’ve had calls or texts from a number of our friends here at the Marina. “Are you guys okay?” They ask, “How are you dealing with the cold? I hear the river is frozen.” and the like. We have some good friends here, but we’re just fine, thanks. But I thought I’d put in a bit about living aboard during winter weather. 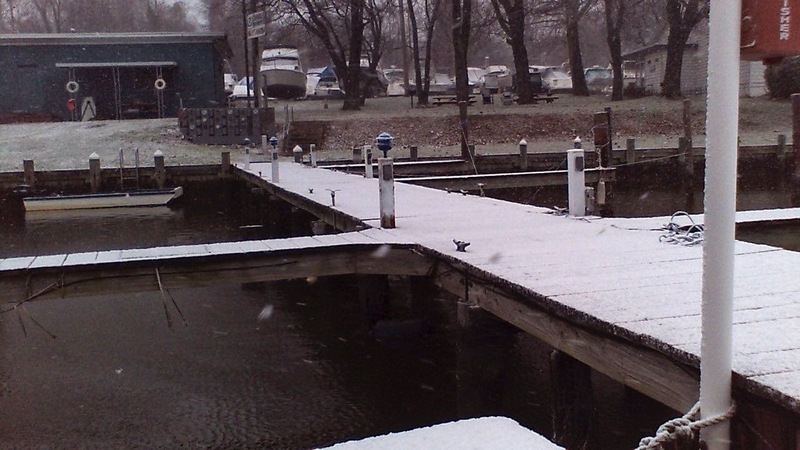 Frozen, snowy, icy, slippery docks and decks can become a hazard. Just getting on and off the vessel is made that much more complicated and, occasionally, dangerous. Ice and snow load can increase the weight of the vessel substantially, making you ride low or less than level. The cold can make unpleasant changes in materials. Lines become stiff and unworkable. Plastics—like our aft tuftex sheeting—can become brittle and snap unexpectedly. Ice can build up in the strangest places: along the bottoms of hatches and ports, in the tracks for sliding windows, and along the tops and sides of railings and handholds, all of which makes normal operation of doors and windows difficult or impossible. Most vessels lack substantial insulation and/or thermal mass, which makes them lose heat rapidly. Cut off your heater, and the temperature plummets. Normal outdoor maintenance and operations—running lines, pulling anchors, dealing with hoses and electrical wiring—becomes a miserable episode of frozen fingers and clumsy tool use. ANYTHING that requires you to put your hands in the water—if it’s possible at all—becomes painful and borderline dangerous. I had to run an air line to increase some of our floatation and by the end of a three minute session my hands were screaming at me. Condensation in small spaces is an issue. Your breath alone can cause water to collect on rooflines and windows. Add to that moisture entering the cabin from cooking or composting toilets and you can literally create a rainfall in your living space. We had an instance a few days ago which resulted in a literal rainstorm over the bed. On an evening in the teens, moisture had condensed and FROZEN in a thin sheen of ice across the underside of the roof membrane between the membrane and the insulation. Once the internal temperature got warm enough to melt the ice—which it did all at once—we had a bit of a flood. Chemical moisture traps like “DampRid” and others do help somewhat, but your two main options are either running a dehumidifier—pricy in terms of power—or periodically opening the doors and windows to flush out the warm, moist air, which, of course, makes it cold inside. Mostly, we just deal with the occasional drip. Ice formation can be a threat to boat hulls, not to mention to docks, floats, fenders, lines, and yourself. Boats, even large ones, are relatively small, enclosed spaces. They don’t take much to heat, and tend to heat up rapidly. 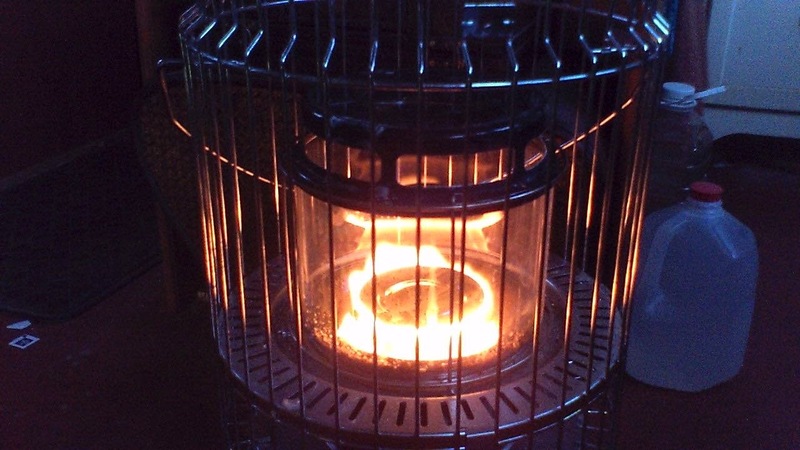 Our kerosene heater can quite literally increase the internal temperature by 20 degrees F in a few minutes, and will easily hold that temperature in the coldest weather. . . .while the thing is running, of course. Because of where boats tend to be moored, the Insolation, that is, the amount of solar impounding, tends to be substantial. The moment the sun is up, our aft temperatures leap 5 degrees F almost immediately in winter, and on sunny days our south facing windows mean that the aft studio requires no additional heat. 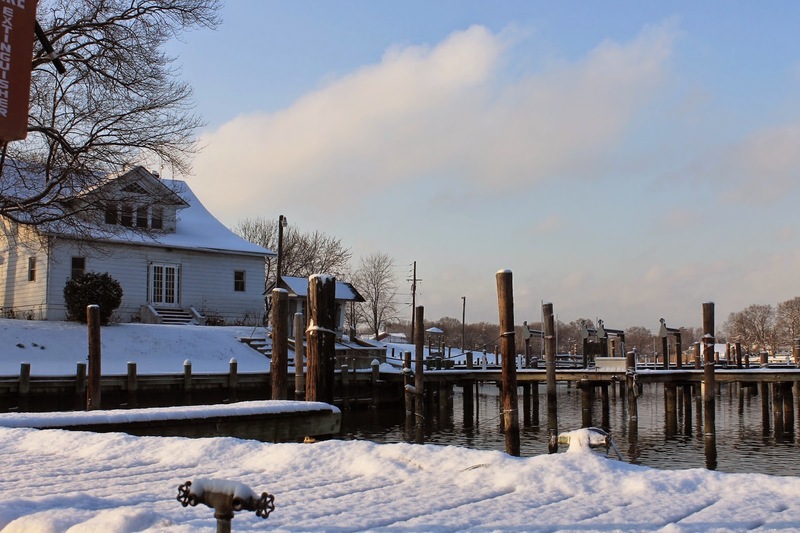 Marinas tend to be quiet places in winter, with little in the way of wakes or noise. It’s just one less set of irritations that make dealing with the cold that much easier. 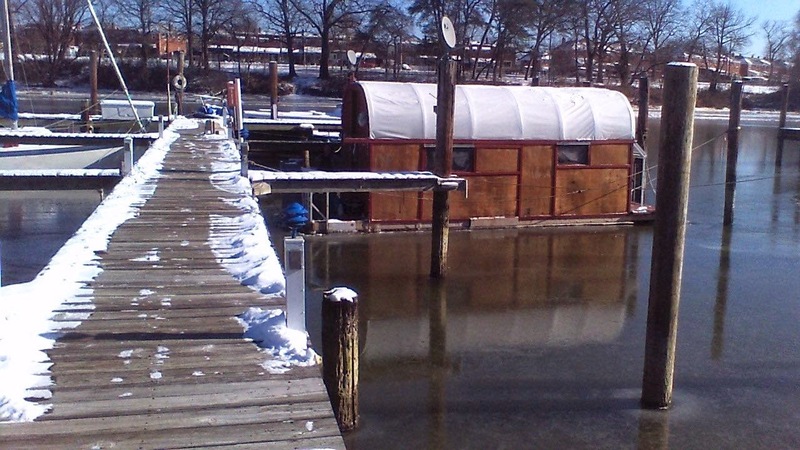 Ice eaters and bubblers are spectacularly effective at keeping ice away from docks and vessels with very little effort. With the boating lightweights gone, you have the place largely to yourself. The quiet, and the beauty of winter on the water, is reason enough to be there. On balance, we’ve enjoyed the winter here thus far (being about halfway through it). It’s quiet, and after a busy summer, the solitude has been nice. But We’ll be more than ready when spring comes. New posts on our other blogs, Life Art Water and Onboard Cooking. I've seen short pieces, here and there of your adventure, but just now came across the blog itself and have been reading from the beginning to see how you put it all together. Very, very interesting. The pipe thing is new to me and something I'm going to give a lot of thought to. Looks like the way to go about it. It's too late for you, but here's what I'll do when putting the stringers in. I worked for about a dozen years doing boat repair and restorations after a 20 year career as captain of yachts and small commercial craft. A good friend and I ran a small boat yard in Fort Lauderdale for several years and he had about 25 years experience in restoring classic boats. Here's how we built dozens of new decks on boats and they will probably outlast the boat that surrounds them. The secret is EPOXY! When you put in the spacers you cut them so that they are SUPER TIGHT. Slather the ends of the spacers with a slurry of epoxy and micro fibers to about the consistency of peanut butter. Then, at each place where the wood butts up against each piece you "paint" on some plain epoxy and then put a fillet on each side. Look at a T you do that on each side where the two pieces meet. When the epoxy kicks off the bond will NEVER break. The wood around the epoxy will fracture before the joint will. There is no need to even use screws, bolts or nails in this method. I know I'm going to be up late tonight going through your blog. I'm alternating between yours and another I found a couple of days ago called Cheap RV Living.com. Lots and lots of good ideas that can easily be adapted to the shanty boat way of life. Richard, thanks for your thoughtful posts. The pipe thing has really worked out for the boat. I installed floor hatches so I could get to and inspect the floatation, and the pipes after a year--or nearly so--on the wet have yet to show any corrosion, and they're far simpler than any of the other systems we investigated. I, too, have found some interesting stuff on Cheap RV, also on many of the tiny house blogs.